1720 ~ 1729: born in Ôsaka. He was the fourth son of the star Yoshizawa Ayame I, who gave him the name of Yoshizawa Man'yo I. 15th day of the 7th lunar month of 1729 : his father Yoshizawa Ayame I died. 11th lunar month of 1732: Man'yo became wakaonnagata and played in the kaomise drama "Mitsu no Hama Kogane no Irie", which was produced in Ôsaka by Arashi San'emon III. 11th lunar month of 1733: Man'yo played the role of Omune in the kaomise drama "Shigeri Matsu Kogane no Takaragura", which was produced in Ôsaka at the Ônishi no Shibai by Nakamura Jûzô I. 11th lunar month of 1735: Man'yo played the role of Yatayû's daugther Takiya in Sadoshima Saburôzaemon's kaomise drama "Ôyamato Kane no Kinzan", which was produced in Ôsaka by Nakayama Shinkurô I. Fall 1737: Man'yo went to Kyôto. 11th lunar month of 1737: Yoshizawa Man'yo I took the name of Yoshizawa Sakinosuke II in Kyôto at Ebisuya Kichirôbê's theater, playing the role of Kotoura in the drama "Hachiman Tarô Denju no Tsuzumi". Fall 1738: Sakinosuke went back to Ôsaka. 11th lunar month of 1738: Sakinosuke played the role of Kiyosaburô's wife Oteru in Matsuya Raisuke I's drama "Sanpukutsui Kogane no Ichigura", which was produced in Ôsaka by Nakamura Jûzô I. 1st lunar month of 1743: Sakinosuke played the role of Osan in the drama "Kurofune Isse Ichidai Otoko", which was produced by Anegawa Shinshirô I in Ôsaka at the Naka no Shibai [casting]. 12th lunar month of 1745: the drama "Natsu Matsuri Naniwa Kagami" was staged for the first time in Ôsaka, simultaneously in the three major theaters of the city; Sakinosuke played the role of Okaji at the Kado no Shibai [casting]. 8th lunar month of 1748: the drama "Yoshitsune Senbon Zakura" was performed for the first time in Ôsaka, at the Naka no Shibai; Sakinosuke played the role of Shizuka Gozen [casting]. 12th lunar month of 1748: the play "Kanadehon Chûshingura", which was originally written for the puppet theater and staged for the first time in the 8th lunar month of 1748 in Ôsaka at the Takemotoza, was adapted for Kabuki for the first time, in Ôsaka at the Kado no Shibai; Sakinosuke played the role of Oishi [casting]. 11th lunar month of 1752: Sakinosuke played at the Kado no Shibai in the drama "Nagoya Ori Hinatsuru no Nishiki", which was produced by Mimasu Daigorô I. 18th day of the 7th lunar month of 1754 : his brother Yoshizawa Ayame II died. 11th lunar month of 1756: second stay in Kyôto; Sakinosuke played the role of Ojû in the drama "Uke Matsuri Hôrai Yakata", which was produced par Somematsu Matsujirô at the Kitagawa no Shibai for the nadai Hoteiya Umenojô. 3rd lunar month of 1757: Sakinosuke played the role of Kisakata Gozen in the drama "Narukami Fudô Kitayama Zakura", which was produced by Somematsu Matsujirô at the Kitagawa no Shibai; his stage partners were Ichikawa Danzô III (Narukami, the deity Fudô Myôô and Kumedera Danjô), Nakamura Kumetarô I (Princess Taema) and Somematsu Shichisaburô I (Minbu). 1st lunar month of 1758: first Kabuki adaptation of the puppet theater drama "Gion Sairei Shinkôki", which was simultaneously produced at the Minamigawa no Shibai [casting] and the Kitagawa no Shibai [casting]; Sakinosuke played in the latter theater the roles of Osono and Miyoshi's wife. Fall 1758: Sakinosuke went back to Ôsaka. 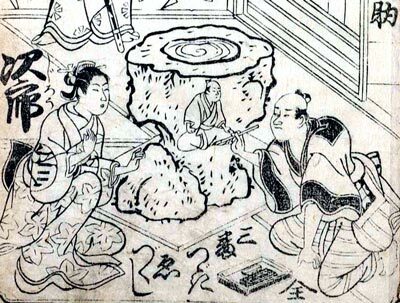 11th lunar month of 1758: Sakinosuke achieved a great success in his hometown, playing at the Naka no Shibai the role of Gennai's wife Tamiya in the kaomise drama "Shitennô Chikara Kurabe", which was produced by Arashi Kichisaburô I and celebrated the shûmei of Fujikawa Hanzaburô III. 7th lunar month of 1759: Sakinosuke played the role of Otatsu in the drama "Natsu Matsuri Naniwa Kagami", which was produced in Ôsaka by Arashi Kichisaburô I. His stage partners were Yamamoto Kyôshirô I (Danshichi Kurobê), Ichinokawa Hikoshirô II (Issun Tokubê) and Kiriyama Monji I (Tsuribune Sabu). 11th lunar month of 1760: third stay in Kyôto; Sakinosuke played the role of Yosenami in the drama "Kiku Nagashi Kokka Taiheiki", which was produced by Nakamura Senzô. Fall 1761: Sakinosuke went back to Ôsaka. 11th lunar month of 1761: Sakinosuke achieved a great success by playing the role of Shizuka Gozen in the kaomise drama "Sotsui Hôshi Kamakura Kagami", which was produced by Nakayama Bunshichi I at the Kado no Shibai for the nadai Fukunaga Tazaemon. 5th lunar month of 1762: premiere in Ôsaka at the Kado no Shibai of Namiki Shôzô I's drama "Koi Hakke Hashira Goyomi", which was a revision of Chikamatsu Monzaemon's drama "Daikyôji Mukashi Goyomi"; Sakinosuke played the role of Otama [more details]. 7th lunar month of 1763: Sakinosuke played the roles of Chiyo and Tatsuta in the drama "Sugawara Denju Tenarai Kagami", which was produced at the Kado no Shibai by Nakayama Bunshichi I; his stage partners were Nakayama Bunshichi I (Matsuômaru, Terukuni), Nakayama Shinkurô I (Kakuju, Shihei), Arashi Hinasuke I (Haru), Anegawa Daikichi I (Tonami, Yae), Nakayama Raisuke I (Umeômaru), Bandô Toyosaburô I (Shiratayû), Fujikawa Hachizô I (Genzô, Sukune Tarô), Ichinokawa Hikoshirô II (Sakuramaru), Asao Tamejûrô I (Hyôei, Shundô Genba) and Nakamura Kichiemon I (Kan Shôjô). 9th lunar month of 1764: première in Ôsaka at the Kado no Shibai of "Oriawase Tsuzure no Nishiki", based on the puppet drama "Katakiuchi Tsuzure no Nishiki", which was produced by Nakayama Bunshichi I and celebrated the 16th anniversary (17th memorial service) of the passing away of the star Anegawa Shinshirô I. A similar play was staged one day later under a different title, "Hare Kosode Tsuzure no Nishiki", at the Naka no Shibai [casting]. The competition for the best performance and the best line-up was open between the 2 theaters. The performance at the Kado no Shibai was more successful than the one at the Naka no Shibai; Sakinosuke played at the Kado no Shibai the roles of Sahei's nyôbô Onui and Jirôemon's nyôbô Oharu [casting]. 1st lunar month of 1764: Sakinosuke's rank in the Ôsaka hyôbanki, wakaonnagata section, was goku-jô-jô-kichi (extreme - superior - superior - excellent). 11th lunar month of 1764: Yoshizawa Sakinosuke II took the name of Yoshizawa Ayame III in Ôsaka at the Kado no Shibai, playing the role of Kochô, in reality Usui no Arawarawa, in the drama "Momotarô Obako Banashi", which was produced by Nakayama Bunshichi I. 4th lunar month of 1766: Ayame played the role of Okaji in the drama "Natsu Matsuri Naniwa Kagami", which was produced in Ôsaka by Anegawa Kikuhachi; his stage partners are Nakayama Bunshichi I (Danshichi Kurobê), Fujikawa Hachizô I (Issun Tokubê), Nakayama Shinkurô I (Tsuribune Sabu) and Asao Tamejûrô I (Mikawaya Giheiji). 12th lunar month of 1766: Ayame played the roles of Oyoshi and Tomoe Gozen in the epic drama "Hirakana Seisuiki", which was produced by Arashi Hinasuke I at the Kado no Shibai; his stage partners were Nakayama Shinkurô I (Gonshirô), Fujikawa Hachizô I (Matsuemon, Higuchi no Jirô Kanemitsu), Arashi Hinasuke I (Umegae), Ichinokawa Hikoshirô II (Kajiwara Genta Kagesue), Nakayama Raisuke I (Shigetada), Arashi Koroku I (Enju) and Arashi Shichigorô II (Kajiwara Heiji Kagetaka). 7th lunar month of 1767: Ayame plays for the last time the role of Okaji in the drama "Natsu Matsuri Naniwa Kagami", which was staged at the Kado no Shibai to commemorate the 6th anniversary (7th memorial service) of the passing away of Fujikawa Heikurô [casting]. 12th lunar month of 1767: Ayame played the roles of Suke-no-Tsubone and Tadanobu in the drama "Yoshitsune Senbon Zakura", which was staged for the first time at the Kado no Shibai [casting]. 11th lunar month of 1770: fourth stay in Kyôto; Ayame played the role of Kagekiyo's wife in the kaomise drama "Sakigake Yashima no Kachidoki", which was produced by Onoe Kumesuke for the nadai Ebisuya Kichirôbê and Kameya Kumenojô. 1st lunar month of 1771: Ayame's rank in the Kyôto hyôbanki, wakaonnagata section, was goku-jô-jô-kichi (extreme - superior - superior - excellent). 11th lunar month of 1771: Ayame played at the Minamigawa no Shibai the role of Kochô, in reality Shinoda no Shôji's daughter Sakaki-no-Mae, in the kaomise drama "Bandai Isaoshi Genji", which was produced by Arashi Sanjûrô II. 1st lunar month of 1772: Ayame played in the same theater the role of Hosokawa Katsumoto's kôshitsu Yosenami in the ni-no-kawari "Keisei Sakura Goten". 11th lunar month of 1773: Ayame played at the Kado no Shibai the role of Kumagai wife's Osaga in the kaomise drama "Medetai Uchimashô", which was produced by Ogawa Kichitarô I. 9th lunar month of 1774: Ayame appeared on stage for the last time, playing at the Kado no Shibai the role of Okeru Iki no To in the drama "Kume no Sennin Yoshino Zakura". 18th day of the 11th lunar month of 1774 : Ayame died. Yoshizawa Ayame III was an excellent onnagata actors, able to play any kind of role in either jidaimono or sewamono dramas. He won a fame for himself only in the Kamigata cities of Ôsaka and Kyôto and did not to travel to perform in Edo. The 18th day of the 11th lunar month of the 3rd year of the An'ei era was the 20th of December 1774 in the western calendar. The 15th day of the 7th lunar month of the 14th year of the Kyôhô era was the 9th of August 1729 in the western calendar. The 18th day of the 7th lunar month of the 4th year of the Hôreki era was the 4th of September 1754 in the western calendar.